WASHINGTON — A congressional defense panel is recommending that the U.S. Defense Department spend $220 million next year to develop an American alternative to the Russian-made RD-180 engine that powers the first stage of United Launch Alliance’s Atlas 5 rocket, a U.S. government workhorse. The strategic forces subcommittee, which has jurisdiction over U.S. military space programs, released its markup April 29 and approved the legislation April 30 for consideration by the full committee. Momentum for developing an RD-180-class engine in the United States has been building rapidly in Congress and elsewhere since Russia’s annexation of Crimea and continued threat to the rest of eastern Ukraine. The House Permanent Select Committee on Intelligence will also work this year to fund a U.S. alternative to the RD-180, Rep. C.A. “Dutch” Ruppersberger (D-Md. ), that panel’s ranking member, told SpaceNews April 17. That panel oversees classified intelligence satellite programs. The Air Force and Defense Department are already examining the feasibility of developing the new engine, which House staff members have estimated would cost about $1.2 billion and take about four years. Government and industry officials acknowledge that changing to a U.S.-made engine on Atlas 5 would drive up the cost of the program. The draft defense authorization bill calls for the defense secretary to coordinate with the NASA administrator to ensure the new engine could be used by both agencies. The RD-180, manufactured by Energomash of Moscow, is powered by a mixture of kerosene and liquid oxygen and generates nearly 1 million pounds of thrust. 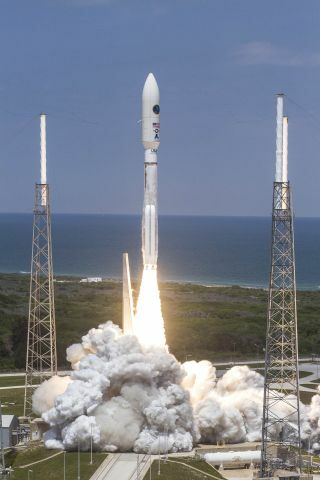 It is imported and sold to ULA by RD-Amross, a joint venture of Energomash and United Technologies Corp.
ULA has 2.5 years worth of Atlas 5 engine inventory on hand at its factory in Decatur, Alabama, and is expected to receive five engines in 2014 and six in 2015. The space-relation portion of the draft defense authorization bill also directs the secretary of the Air Force to provide a report to Congress’ defense committees on the health of the GPS constellation after the service said in March it would slow the replenishment of its positioning, navigation and timing satellites. Lockheed Martin Space Systems of Denver is under contract to build eight next-generation GPS 3 satellites, the first of which is expected to launch in 2016 to begin replacing the current-generation GPS satellites. The Air Force in March said it intended to buy just one additional GPS 3 craft, rather than two as previously planned, in 2015. The planned procurement slowdown, coupled with delays to the GPS 3 satellites already under contract, would also push the award of five of the associated launch contracts beyond 2017, Air Force officials have said. The bill also includes language directing the Air Force to initiate a competitive procurement next year to launch the second of two refurbished military weather satellites. The Air Force has spent hundreds of millions of dollars refurbishing and storing the last two satellites in the Defense Meteorological Satellite Program, which for decades has provided global weather data to support military and intelligence-gathering operations. The first of those satellites, DMSP Flight 19, was launched in early April, but the Air Force has been noncommital about launching the second. The bill limits funding for a follow-on weather satellite program until the defense secretary submits to the relevant congressional defense committees a report on the Pentagon’s meteorological and oceanographic collection requirements, its use of weather data from outside sources and a launch plan for DMSP Flight 20. Finally, the draft legislation requests a report on potential strategies to face counterspace efforts from Russia and China. In recent months, senior U.S. military and intelligence officials have repeatedly told Congress about the growing threat to U.S. national security space assets. In January, U.S. Director of National Intelligence James Clapper told the Senate Select Committee on Intelligence that the threat will increase in 2014 and that China and Russia in particular have demonstrated counterspace capabilities. Follow Mike on Twitter @Gruss_SN. This story was provided by SpaceNews, dedicated to covering all aspects of the space industry.